Wednesday, October 26th was National Campus Sustainability here at CofC and at colleges and universities across the country. National Campus Sustainability Day is a day for awareness raising founded by AASHE, the Association for the Advancement of Sustainability in Higher Education. You can read more on the history of its creation here. At the end of the day, we took the full chalkboards, counted the responses and turned the results into a word cloud to see where the campus community’s sustainability consciousness is. You can see what we came up with here. 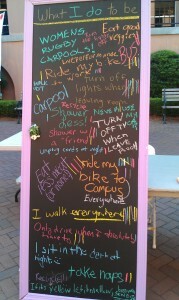 Along with the chalkboards, volunteers from both the Office of Sustainability and Green CofC walked around the Cougar Mall with iPads, encouraging people to digitally sign the new Office of Sustainability pledge. In just a few short hours, we were able to collect almost 200 signatures with just three iPads. In the near future, we’ll have the pledge and the ability to sign it available on the Office of Sustainability’s website. Right now this is a very basic pledge, one which many people who signed it might not really know how to follow through on. What is a “culture of sustainability?” But as the Office of Sustainability continues to develop over the next year, we’ll be working to expand and extrapolate on the meaning of this pledge and make sure that everyone in the College of Charleston community knows what it means to create and to foster a culture of sustainability. Another way the Office of Sustainability marked Campus Sustainability Day was by holding the College of Charleston’s inaugural “Green Bag” Lunch Series. This is the kick-off of a monthly series in which CofC faculty, members of the Charleston community and outside speakers will be hosted for an informal lunch lecture and discussion. This event also marked the first official public event for the Director of the Office of Sustainability, Dr. Fisher, so it had the duel purpose of serving as a “Meet the Director” lunch. Dr. Fisher used the occasion to outline his vision of sustainability and the future of the College of Charleston’s role in creating a more sustainable community and future. The audience of about 30 ranged widely from faculty, staff and students, with an engaging discussion following Dr. Fisher’s presentation. The next Green Bag Lunch will be at noon on November the 17th in the Stern Center Ballroom, featuring MIT’s Dr. Deborah Cramer. You can get more information and RSVP here. To wrap up Campus Sustainability Day, Green CofC hosted an evening screening of Earth Days, a documentary featured as the closing film at the 2009 Sundance Film Festival and was later featured as a PBS American Experience special. You can watch the film streaming for free brought to you as a courtesy by PBS here. With three separate events behind us, the College of Charleston’s first National Campus Sustainability Day was a great success and sure to lead to an even greater Campus Sustainability Day this time next year. Thanks to all of those that came out and if you haven’t yet signed the pledge, remember to keep an eye out on the Office of Sustainability website for an iPetition link!